Chardonnay is the most popular white grape breed in whole world. It pretty good can accommodate different climatic conditions and soils, and gladly submit different transformations and wine maturation processes, therefore it has earned popularity between vine cultivators, winemakers and consumers. Chardonnay breed has tendency to form absolute wines, full with extract matter and satisfactory sour level. It pretty good lives along with oaken, as well as changes flavor character depending from climate and sun amount that grape receives. Chardonnay native country is Burgundy (France), but breeds it almost in all world – in Australia, in New Zealand, USA, Italy, Spain, South-Africa, Chile, Argentina, Austria etc. Wine nuance ranges from warm climate breeded, viscous and fruity wine, which mostly comes from new world to classical dry and discrete France north wine, where we can notice wet rock and salty sea water bouquet. Judging Chardonnay aroma and flavor bouquet, certainly we notice butterness, which inheres this wine, sometimes roasted nuance too. In this aroma is apple, citrus, melon, pineapple scores. Color varies from yellow to saturated goldy tone, it depends from ripeness. Below just visual I tried to interpret Chardonnay wine peculiar nuance of its bouquet. Ordinary origin Chardonnay white wines are devised for immediate usage and they don’t pretend to range in wine collector collections. Furthermore the best cool climate Burgundies, among them Chablis too, can hold 5-15 year time challenge and develop delicate flavor bouquet. We need to mention that Chardonnay grape is real French champagne base – Champagne Blanc de Blancs, which are made in Champagne province. Chardonnay wine, like all other white wines, serves cool at 6-12C. Open shortly before serving, pouring in glass. Chardonnay perfectly fits with sea food, fish, green salad, white bird meat, half-hard cheese, as well as fruits and desert. Lasted out from old wines, classical Burgundy Chardonnay and new world good ripen, absolute wines has to be served in rounded shape glasses (1 image). It’s just because wine needs to get on palette, surrounding side taste-buds and to be able to perfectly feel bountiful flavor bouquet. 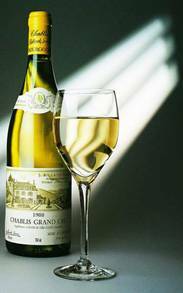 But new, refreshing Chardonnay fits classical white wine glass (2 image). Further several tasted Chardonnay wines. In last lesson, when we talked about French wines and about Burgundy area too, we tasted Bouchard Pere&Fils La Vignee Chardonnay 2008 (Price in shop „Vintage”: LVL 9,74). Wine has been holded out in French oaken barrels. Serving temperature is 10-12C. Lightly yellow color. Aromatic, round, silky. Small sour and fruit score. I wouldn’t choose it, if it was all by itself, but it perfectly fitted with Larisas prepared, and with it served, cream from Mascarpone cheese, capers and smoked salmon. In the last lesson, which was devoted to South-African wines, we tasted Glen Carlou Quartz Stone Chardonnay Single Vineyard 2008 (Price in shop „Vīna Studija”: LVL 16,50). Brightly yellow color. In the wine aroma we feel typical white bread aroma, as well as nut flavor. Both it is all by itself or with Kisch from chanterelle and chicken meat, it is very good. The next Chardonnay we discovered in one nice evening wine room TINTO, close by cinema in Riga -Plaisir de Merle Chardonnay 2008 (Price in restaurant TINTO: LVL 18, shop price – LVL12). Holded out in oaken. In the aroma, you can feel pleasant vanilla score, fruity flavor. Relishing both is it all by itself or with food. I chose tiger prawns and green salad. In the lesson, which we judged food concord with wine, we tasted wine from Australia too - Roxburgh Chardonnay Hunter Valley 2005 (Price in shop: LVL 12,48). Deep yellow-green bright color, like Sun herself was in the glass. Wine has been held out for nine months in new French oaken barrels. Sensitive, saturated wine. In variety of smoked salmon, wine gains an advantage, in second combination – salmon made in paper-bag with herbs, nothing amazing. Saturated wine color promised something more than flavor showed, but it is only my subjective opinion. I have already mentioned this wine and cheese harmony once, but I want to suggest with image once again - La Chablisienne Chablis Cru Beauroy 2005 (Price in shop: LVL 14,98). Citrus, mango, pear aroma. Sour level is low. It’s perfect all by itself and with Emmental cheese. V.Grandāne, A.Ritenis. Vīns. – R: Jumava, 2010. Chardonnay - Wikipedia, the free encyclopedia. Larisas Krūmiņas independant wine course notes.